A sixteenth century depiction of the Hanging Gardens of Babylon by Martin Heemskerck. The Tower of Babel is visible in the background. The Hanging Gardens of Babylon (also known as the Hanging Gardens of Semiramis) are considered one of the ancient Seven Wonders of the World. They were said to have been built by Nebuchadnezzar II around 600 B.C.E. The image of the gardens is impressive not only for its beauty, but also for the engineering feat of supplying the massive, raised gardens with soil and water. The lush Hanging Gardens were extensively documented by Greek historians such as Strabo and Diodorus Siculus. However, these are not eyewitness accounts, and there is little first-hand evidence of their existence. Some circumstantial evidence gathered at the excavation of the palace at Babylon has accrued, but does not substantiate the apparently fanciful descriptions of ancient writers. Through the ages, the location of the Hanging Gardens may have been confused with gardens that existed at Nineveh, since tablets from there clearly show gardens. Presumed to have been located on or near the east bank of the River Euphrates, about 31 miles south of Baghdad, Iraq, the Hanging Gardens of Babylon—with their blossoming flowers, ripe fruit, gushing waterfalls, terraces lush with rich foliage, and exotic creatures roaming about—may have been only a figment of the fertile imagination of Greek scholars and poets, or the boasts of returning soldiers. During the rule of the well-known king, Hammurabi (1792–1750 B.C.E. ), the kingdom of Babylonia rose to prominence above the cities of Mesopotamia. However, Babylonian civilization did not reach the apex of its glory until the reign of Nabopolassar (625–605 B.C.E. ), who began the Neo-Babylonian empire. His fabled son, Nebuchadnezzar II (604–562 B.C.E. ), the presumed builder of the legendary Hanging Gardens is said to have constructed them in order to win favor with his wife, Amyitis, who had been "brought up in Media [an ancient country roughly in the area of the northwest of modern Iran] and had a passion for mountain surroundings." Philo of Byzantium, thought by many to be the first to compile a list of the Seven Wonders of the World in the late second century B.C.E., raised the issue whether the plants in the Hanging Gardens were hydroponic. Philo noticed that plants were cultivated above ground, while the roots of the trees were embedded in an upper terrace of the garden rather than in the earth. This was certainly an advanced agricultural technique for the time, if true. Strabo, the first century B.C.E. Greek historian and geographer, in Book 16 of his 17-book series, Geography (in the Middle East), described the geo-political landscape of the Hanging Gardens, as he did with much of the known world during the reigns of the first two Roman emperors, Augustus and Tiberius. The approach to the Garden sloped like a hillside and the several parts of the structure rose from one another tier on tier. On all this, the earth had been piled…and was thickly planted with trees of every kind that, by their great size and other charm, gave pleasure to the beholder. The water machines [raised] the water in great abundance from the river, although no one outside could see it. The Garden is quadrangular, and each side is four plethra [one hundred Greek feet] long. It consists of arched vaults which are located on checkered cube-like foundations. The ascent of the uppermost terrace-roofs is made by a stairway (Strabo). The Hanging Garden has plants cultivated above ground level, and the roots of the trees are embedded in an upper terrace rather than in the earth. The whole mass is supported on stone columns. Streams of water emerging from elevated sources flow down sloping channels. These waters irrigate the whole garden saturating the roots of plants and keeping the whole area moist. Hence the grass is permanently green and the leaves of trees grow firmly attached to supple branches. This is a work of art of royal luxury and its most striking feature is that the labor of cultivation is suspended above the heads of the spectators (Philo of Byzantium). Stone tablets from Nebuchadnezzar’s reign give detailed descriptions of the city of Babylonia, its walls, and the palace, but do not refer to the Hanging Gardens. 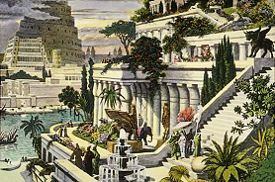 Today, some historians make the case that the Hanging Gardens of Babylon never actually existed. Image of a "Hanging Garden" from an Assyrian tablet. They stake their claims on the fact that the warriors in the army of Alexander the Great were amazed at the immense prosperity of the thriving city of Babylon and tended to exaggerate their experiences greatly. When the soldiers returned to their stark homeland, they had incredible stories to relate about the remarkable gardens, palm trees, and imposing buildings of rich and fertile Mesopotamia. This was, after all, the land of Nebuchadnezzar’s fabulous palace, the great Ishtar Gate, the legendary Tower of Babel, and other pyramid-like ziggurats. When all of these extraordinary architectural elements were combined together in the imagination of the poets, scholars, and historians of Ancient Greece, the result was another, although fictional, World Wonder. Others point to Assyrian tablets showing raised "hanging" gardens from the city of Nineveh, raising the possibility that the Babylonian gardens may be exaggerated, fanciful versions of what existed in another major Mesopotamian city. Twentieth century archaeologists began collecting evidence about unsolved questions concerning the Hanging Gardens: What was their location? What kind of irrigation system did it have? What did the Hanging Gardens actually look like? These questions have yet to be fully answered. Recent archaeological digs at Babylon have unearthed a major palace, a vaulted building with thick walls (perhaps the one mentioned by Greek historians), and an irrigation well in proximity to the palace. Although an archaeological team surveyed the palace site and presented a reconstruction of the vaulted building as being the actual Hanging Gardens, accounts by Strabo place the Hanging Gardens at another location, nearer the Euphrates River. Other archaeologists insist that since the vaulted building is thousands of feet from the Euphrates, it is too distant to support the original claims even if Strabo happened to be wrong about the location. The latter team reconstructed the site of the palace, placing the Hanging Gardens in a zone running from the river to the palace. Interestingly, on the banks of the Euphrates, a newly discovered, immense, 82-foot thick wall may have been stepped to form terraces like those mentioned by the ancient Greek sources. Wright, Richardson Little. The Story of Gardening: From the Hanging Gardens of Babylon to the Hanging Gardens of New York. Dover. 1983. 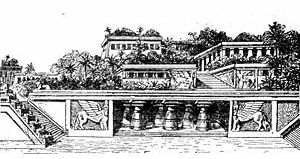 History of "Hanging Gardens of Babylon"
This page was last modified on 26 July 2017, at 16:33.